A pretty big update is on its way for those who love Waze's navigation app. Version 4.0 of Waze has been redesigned to give the UI "higher visibility and clarity" in an effort to make it easier to get to the options you want the most while still getting the most from the map view. But, the most important change could be in battery usage. Unfortunately, Waze is being a bit coy on the battery improvements, saying only that "version 4.0 significantly reduces battery consumption" without offering specifics, so your mileage may vary. The more noticeable changes are in the redesign which aims to cut down the number of taps needed to get around the interface and make it easier to tap the options you want. The left button is your dedicated navigation button and will slide out a menu with your favorite frequent destinations, while the button on the right gets you to your contacts. The big middle button gets you to alternate routes and a quick option to share your ETA with friends. The report menu has been redesigned to be full-screen and color-coded to make it easier to get the options you want, so traffic reporting is a big red button, police is blue, hazards are orange, etc. The overall look is still very familiar to Waze users and isn't really adopting any OS-specific design language, but Waze is getting a nice feature from its parent company, Google - reminders to leave at a certain time to make it to calendar events. Waze just says to "sync your calendar", so it doesn't appear to be tied specifically to Google Calendar and may well work with others. 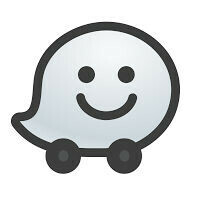 Waze 4.0 is available now for iOS users, but Android users will have to wait on it. No word on when the Android version will be coming out, but Waze promises that it is "on the way." With Windows 10, new apps that work for the desktops SHOULD work on mobile no problems whatsoever, which may change things. But to a buyer, that one app can make a difference between moving to an Android and buying a new iPhone instead. I think that the update schedule for apps is relatively low on the consumer's mind as opposed to hardware or OS features. Do I care that Waze gets updated on iOS a few weeks before Android over the ability to use NFC for functions other than payment services, or to use my phone as a mass storage device when connected to a computer? How about IR blaster or true multitasking..... The time between when an app updates on one platform over another is not taken into consideration by anyone because it really doesn't matter. Wouldn't trade if for any other mobile OS right now. Nothing else compares. Why does Google not merge Google Maps and Waze? Good question, Google Maps already pulls traffic data from Waze. Again Google neglects Android in favor of iOS. I'm quite certain that the Android update will follow very shortly. In the meantime I have no issues with the current version and I don't usually touch my phone while I am driving in any case, so tapping the phone less really isn't a factor for me, and it really shouldn't be a factor for most people that aren't looking to blindly rear-end a truck at 100 kph. without even leaving so much as a breaking skid mark on the road. Lol how is Android second when it's a Google product?